I had only just celebrated my sixth birthday, but I remember well the night in October 1957 when my father woke me before dawn and led me by the hand, still in my pajamas, out the back door of our home and into the darkness. We walked through high grass at the back of our property, wet with early morning dew, to the top of a small hill. 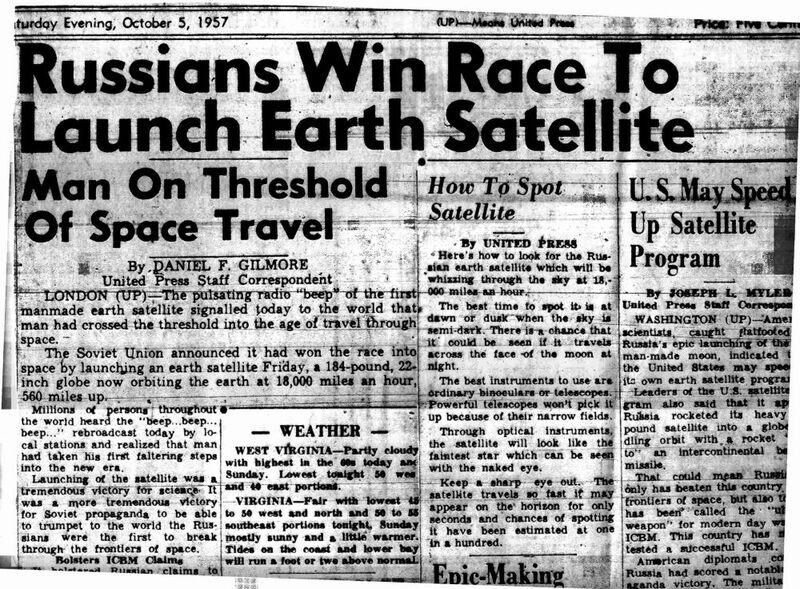 We hoped to catch a glimpse of the ominous Sputnik satellite that the Soviet Union had just launched, which the local newspaper predicted would fly over our heads early that morning. Everyone was obsessed with the idea that the Communists were now able to send threatening space vehicles right over our skies – spacecraft that we could even see with our own eyes! 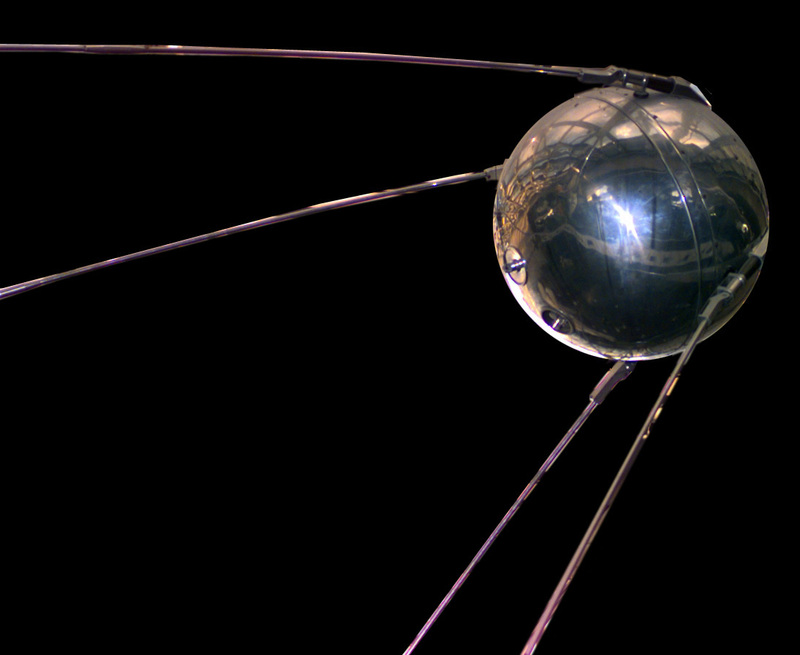 Sputnik was terrifying, but also marvelous, because we realized the future had just taken off. After many minutes of waiting and watching the Northeastern horizon, there it was: the Sputnik! My father and I watched in fascination as the tiny, bright light moved slowly across the sky towards the South. And, sure enough, it looked to me like it was coming right over our house. This was an overwhelming idea for us at the time, that humans could propel vehicles beyond the layers of air and cloud and send them into outer space. Until a few weeks before, this had been only the realm of science fiction. I was terrified of Sputnik for good reason. Near our home outside Washington, D.C. we could drive by a battery of Nike missiles pointing their nosecones at the sky, and even young children knew their purpose. Newspaper articles on Sputnik included information on how to see it in the night sky. Courtesy of McDowell Public Library. At my elementary school a big ominous siren for air raid warnings squatted atop a tall pole overlooking the playground. It would regularly shock us with a loud, shrill blast—then we would practice climbing under our little desks for shelter to be ready in case a nuclear bomb detonated nearby. Even schoolchildren knew that would probably be futile if the real thing happened. So the Sputnik my father and I watched was truly alarming, for it seemed to be proof that the Soviets were ahead of us. We were still haunted by memories of the Korean War and politicians and media kept warning of Communist threats. But Sputnik also seemed marvelous, because we realized the future had taken off. Its launch was a wake-up call that set our nation on the race to conquer space, to catch the Communists and beat them into the cosmos before they could control the very skies over our heads.